I love eBay. Say what you will about what it's done for the shoe "game," but all I know is that it's aloud me to get shoes I know I'd get otherwise. 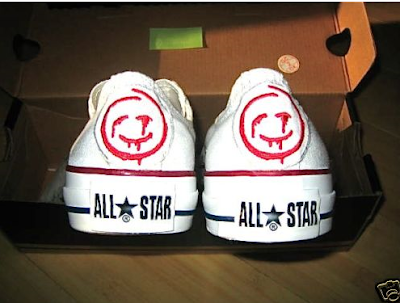 Take these Chucks below, they're the Red John Chucks. Red John is the unseen character in the CBS hit show "The Mentalist." 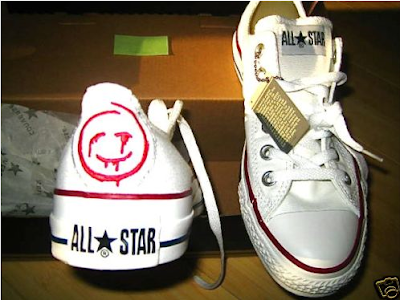 Converse worked with the stars of the show to create a unique Red John pair of Chucks for the cast and crew as a special thank you for their work on the 2nd season. I was extremely lucky to get these on eBay. I was able to get a truly unique and limited item that I wouldn't have been able to get without eBay. 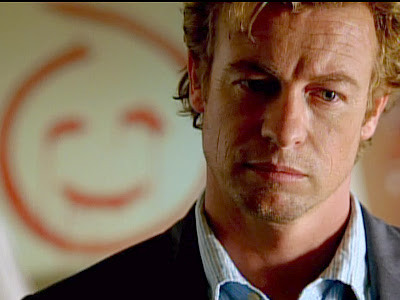 Above you see a picture of the show's star Simon Baker and the Red John logo on the wall. Red John leaves the logo behind every crime scene. Thanks for checking out the blog, remember to follow along on twitter @TheCovnerseBlog. How nice! Want those Chucks!